Hundreds of high school students from across North America will gather at the Sheraton Hotel in Stamford, CT, to debate the world’s fate at the 19th annual Yeshiva University National Model United Nations (YUNMUN) conference. The event will take place on Feb. 8 – 10 and is expected to draw about 450 students representing 42 high schools from both the United States and Canada. The AVI CHAI Foundation has given a grant to fund Religious Understanding in Adolescent Children (RUACH), a new project of the Institute for University-School Partnership at Azrieli Graduate School of Jewish Education and Administration. The two-year collaborative initiative between the Institute and eight Jewish day schools will explore creative means of promoting growth in students’ relationships with God and their religious actions and beliefs. In the combative, spirited world of high school competitions, Yeshiva University is well known for its basketball tournaments and model United Nations debates. A new program under the aegis of Rabbi Isaac Elchanan Theological Seminary (RIETS) is now encouraging students to show their intellectual prowess in learning Talmud. High school students from across North America honed their leadership skills at the bi-annual Eimatai Leadership Development Conference in Baltimore on Nov. 11-13, under the mentorship and guidance of undergraduate students from Yeshiva University who just a few years ago were participants in the conference themselves. When students from nine day schools and yeshivas in the United States joined thousands of others in Jerusalem on May 16 to celebrate the 40th anniversary of its reunification, they may not have been there in person, but they were certainly “seen and heard,” says Nathan Kruman, associate director of the Association of Modern Orthodox Day Schools and Yeshiva High Schools (AMODS). 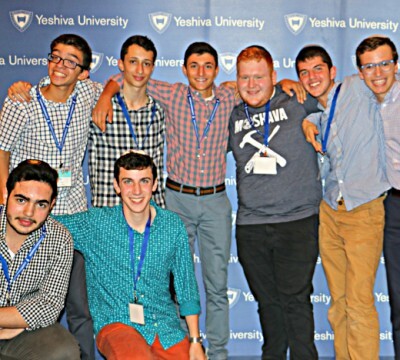 High school juniors from Los Angeles to Miami spent a month at Yeshiva University this summer, meeting other Orthodox high school students, enjoying New York City, and experiencing all that YU has to offer.